Year upon year, us Brits complain about the weather. Well, I think all that whinging has finally paid off because what a summer we've had so far! I can't remember a summer like this, we've had pretty much three months of none stop sunshine. I've loved every minute of it, even when the temperatures broke into the 30's! With this in mind, I thought I'd put together a post all about our summer favourites and the things which we've been loving lately. I decided to start the post with three favourite pieces of clothing, one from Noah, one from Ava and one from myself. Noah is such a fan of sun hats and this year he wanted a straw trilby, just like his older cousins. It's such a versatile piece as it goes with so many different of his outfits, making him looks stylish whilst protecting his face from the sun too. Now, these beauties from Jimmy Choo have been on my wishlist for years, the only thing is I think I want them in every colour! Luisaviaroma has so many different shoes for women, in all styles and sizes, from so many different high-end brands. I can easily spend hours browsing through the website, planning the shoes I want to buy next! I had to list this stunning dress which we were recently gifted, we are in love with it. 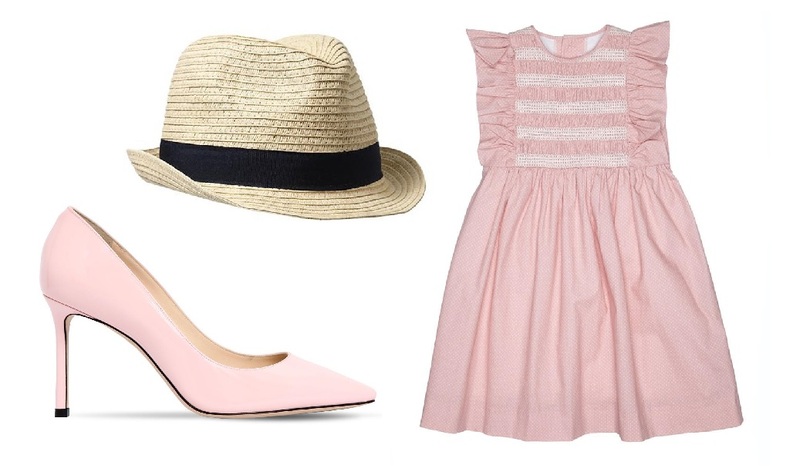 It's from La Coqueta, a website which stocks beautiful Spanish clothing for babies and children. I was invited to browse through the girls dresses section and fell head over heels in love with the Bergia dress because it's just perfect. From the styling to the colour, to the cut. It's a dress that can be worn from season to season and I hope that Ava gets lots of wear out of it! I don't know about you but the last thing I want to do when it's hot outside is to wear makeup. I don't really like wearing it at the best of times, never mind when it's that hot that it's sweats off in minutes. Enriched with 24hr hydration it's a hardworking, multi-tasking cream that leaves your skin gloriously glowing and almost picture perfect. It blends into your complexion for a colour adapting, dewy, even-finish that perfectly matches your skin tone. 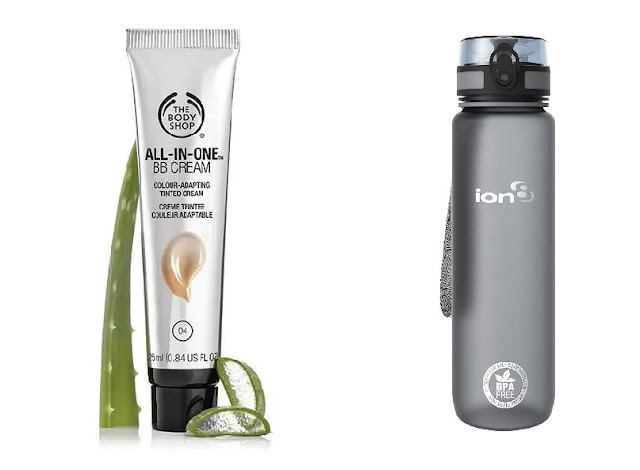 I've been going through so much of the all in one BB Cream from The Body Shop that I just had to mention it in this post. I'm always trying to up my water intake and this water bottle from Ion8 has really encouraged me to do so. It's great for everyday use, at the gym or for outdoor fitness. The 1000ml capacity will see you through an intense workout or gruelling bike ride. It's totally leak proof and can be used in a dishwasher too. Antibacterial cleaning products are an essential no matter the time of year but they are a parent's best friend during the summer holidays! 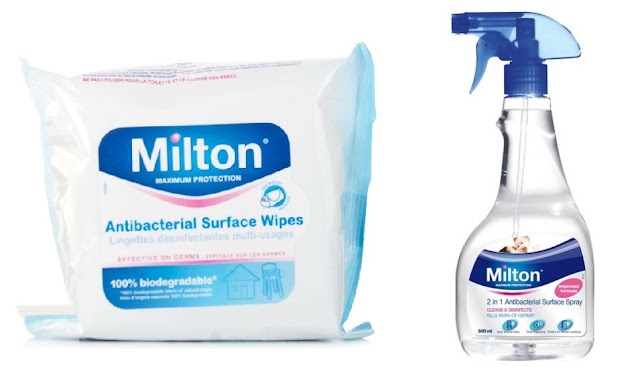 Milton's fast and effective germ-killing action in a ready to use spray gun format for use all around the kitchen, nursery and home. Clinically proven to kill a wide range of bacteria and fungi, including E Coli 157, Listeria, Salmonella, Campylobacter, Shigella and Candida Albicans. Boys Trilby :- Wonderful idea. Sunhat been needed due to weather. A hat can be smart. I can recall a great - uncle who always wore a smart / dressy hat, we loved him as he was really friendly and cheery. I thought he looked like a true gentleman with his hat. Whilst he behaved like a true gentleman. Would love to see a photo of Noah wearing his trilby. Patent Leather Pumps :- Look nice. Don't like the price. Also I think we should all be encouraged, enabled, and supported in regards to good foot care, as well as good joint care. As our feet are important parts of us. Mobility is beneficial for us, comfortable, practical footwear is essential if we are to get long term use of healthy feet :- We need to appreciate our feet by taking good care of them. That girls dress is so pretty! I also like the boys trilby. Very stylish! Bergia Girls Dress :- Pretty. Though expensive.